Many Christmas traditions and customs are transparently based on the old Roman feast of the Saturnalia, which was enjoyed for seven days toward the end of December, during the celebration of the Roman god Saturn. 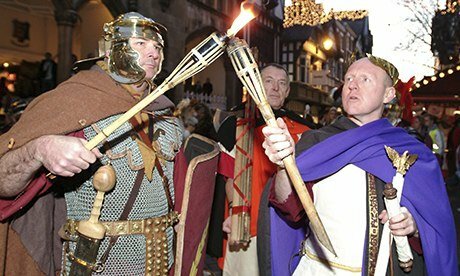 Celebrate Christmas in Chester and watch this unique Roman Parade. A torch lit procession of Roman Soldiers marching through the centre of Chester.